Other times, you choose your clothes strategically, in order to create a certain effect — in order to give yourself a certain advantage. One of those times is when you want to convey “power” — when you find yourself in a situation where you need to project confidence, status, authority, and competence to the people you’re interacting with. You wear it when you need to impress and, to some degree, take charge, or at least look like someone who could take charge if needed. It’s not exactly an interview or a sales outfit, although it shares some characteristics with both of these — it’s best suited to slightly confrontational settings like boardrooms, halls of government, and courts of law. 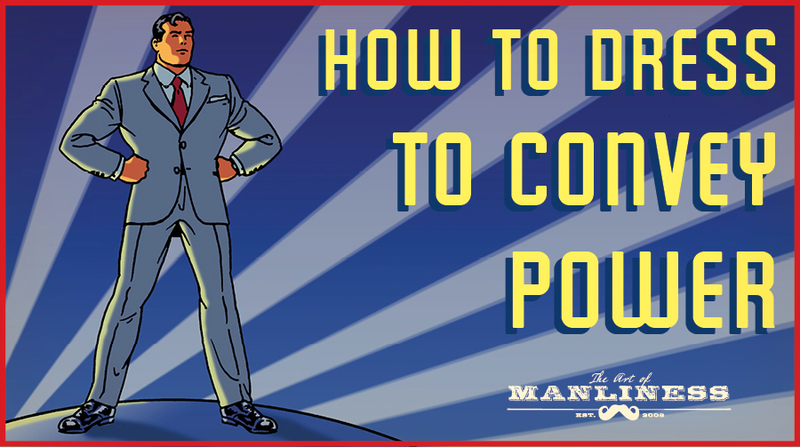 Expect to routinely see lawyers, politicians, and executives sporting the “power outfit” look — and don’t be afraid to use it yourself if you operate in these roles, or are going to be interacting with those who do. The language of style is unambiguous on how to project male authority: wear a suit. There aren’t really any exceptions to that rule. When you really want to take charge of a room, wear a suit. Anything less is more ambiguous in its authority. The suit says “Yes, I’m ready to do serious business.” Anything else leaves room for doubt. A suit enhances the masculine V-shape, conveys status, and looks disciplined and put together. Charcoal gray beats anything else, even a deep navy or a black. There’s nothing quite as serious-looking as a good charcoal gray. There are two pattern options: solid, or striped with widely-spaced, plain white pinstripes no more than the width of a small needle. A single-breasted jacket with a generous spread makes your chest look prominent, signaling authority. Sharp, squared off-shoulders also give you the impression of bulk and authority. However, avoid obvious padding that softens the line of your shoulder. Peaked lapels aren’t mandatory, but they do make the front of your jacket more striking, and a little more aggressive. Don’t be afraid to use them, so long as the peaks aren’t absurdly flared. In addition to the power suit (which must, obviously, be well-fitted to your personal measurements, not just your rack size), wear a plain white shirt, black leather shoes and belt, and a deep-colored necktie with conservative patterning. Red has long been the “power” color of necktie, to the point that it’s almost a cliché, but don’t feel bound to it — a deep blue, green, or purple also projects authority, so long as the color is both rich and deeply-dyed. Suits should be clean and freshly-brushed. The trousers should have crisp, visible creases, and the jacket should have enough body to sit firmly on you without slumping. Shirts should be plain white, freshly pressed, and free of any staining. The collar points should be straight and stiff, and the collar should be free of any rolling or folding in the back. Wear a pocket square. Plain white in a crisp, horizontal fold or sharp peaks gives you the most “powerful” look. A puff or flowery fold is too soft-edged. Read more about how to rock your pocket square. Match your metals; match your leathers. The color of your shoes and belt should match; the color of your watch and any other jewelry should match. The only jewelry you should wear is a dress watch, cufflinks if necessary, a simple tie pin or clip if desired, and a wedding band if relevant. Notice that the watch has no “if” statement — you should be wearing one. Shoes should be plain black oxfords polished to a bright shine. Socks should match the trouser color, not the shoe color. Your necktie knot should be centered and symmetrical. If you have a broad face, use a large knot like the Full Windsor; if you have a smaller face use a narrower knot, like the Half-Windsor. Clean and groom from head to toe. Get a haircut a week before (not the day before — it can look weirdly short if it’s too fresh). Consider getting a manicure — it won’t make your nails look like a lady’s, it will just trim them up, adding to your overall polish. Shower several hours before your important meeting (to give your skin and hair time to fully dry) and wear no scent outside of a very light deodorant/antiperspirant. These sound minor. They are not. If you’re dropping the ball on several of these all at once, you don’t look like a power player — you just look like a guy in a nice suit. Added together, these are the details that combine to give you that razor-edged crispness, and set you apart from (and ahead of) the pack. The right suit proves that you’re here for business. Crispness and correct dress standards prove that you’re not an amateur. But how do you subtly tell people that you’re the top dog in the room? This is one of those situations where there really is no substitute for quality. Fit. This is the most important consideration of all. Your suit and shirt should be as custom-tailored as you can afford, and closely-fitted. Even a heavyset man should wear his clothes close to the body. No one looks good with loose cloth or sagging clothes. Fabric. This is the second-most visible indicator of quality. Yes, you really can tell the difference between a $300 suit and a $1,500 suit at a glance. The weight, drape, and luster of the higher-quality wool is unmistakable — and yes, it should be 100% wool. Style. The conservative business style was discussed above. In the interests of quality, the style should also be customized for your body — a broadly-built man, for example, will want slightly wider lapels than a skinny man, while a very small man would want the pockets situated higher on the front of his jacket. You get what you pay for in the world of high-end menswear, and people will be able to recognize it at a glance. Invest as much as you can reasonably afford in your power outfit. It’s what you’ll be wearing when the stakes are highest. Suit up, this is the best gentlemen fashion feeds we've found.